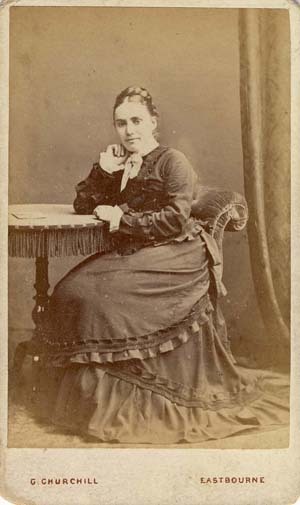 Carte-de-visite portraits were small albumen photographic prints mounted on cards, measuring roughly 21/2 inches by 41/4 inches (6.3 cm by 10.5 cm). 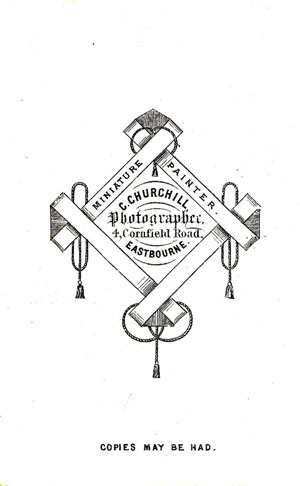 [ABOVE] The reverse of a carte-de-visite portrait showing the trade plate of George Churchill, Photographer, 4 Cornfield Road, Eastbourne (c1870). [ABOVE] A carte-de-visite portrait of a seated woman, photographed by George Churchill of 4 Cornfield Road, Eastbourne (c1870). 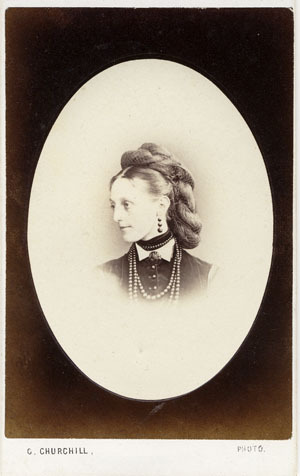 [ABOVE] An oval vignette portrait of a young woman, photographed by George Churchill of 4 Cornfield Road, Eastbourne (c1872). 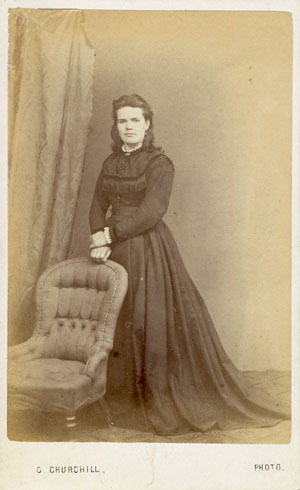 [ABOVE] A carte-de-visite portrait of a woman standing by a chair, photographed by George Churchill of 4 Cornfield Road, Eastbourne (c1870). 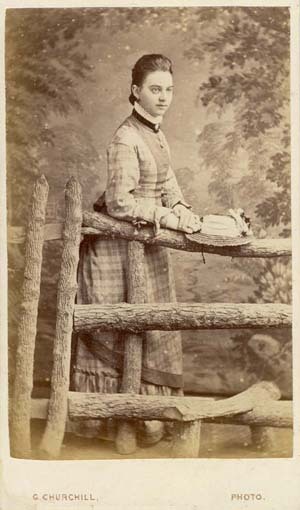 [ABOVE] A carte-de-visite portrait of a woman standing by a rustic wooden fence in front of a painted woodland scene, photographed by George Churchill of 4 Cornfield Road, Eastbourne. 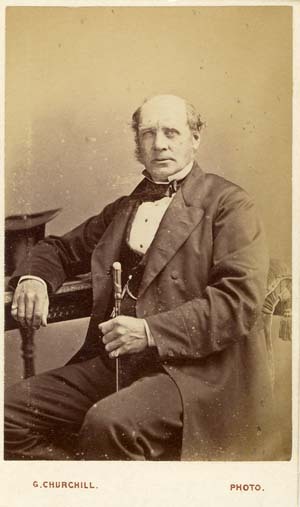 (Inscribed "Taken September 1875" ). 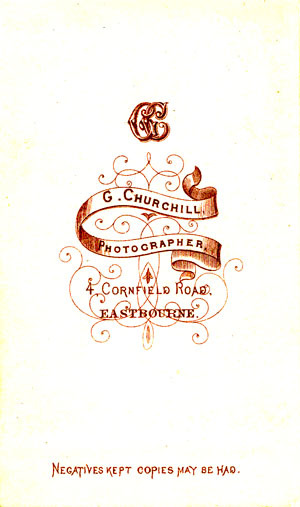 [ABOVE] The reverse of a carte-de-visite portrait showing the trade plate of George Churchill, Photographer, 4 Cornfield Road, Eastbourne (c1875). 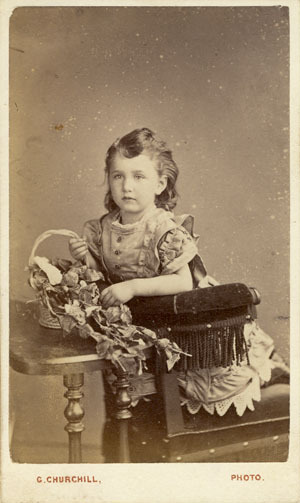 [ABOVE] A carte-de-visite portrait of a girl kneeling on a chair and holding a basket of flowers, photographed by George Churchill of 4 Cornfield Road, Eastbourne (c1876) [ABOVE] A carte-de-visite portrait of a seated man, photographed by George Churchill of 4 Cornfield Road, Eastbourne (c1876). 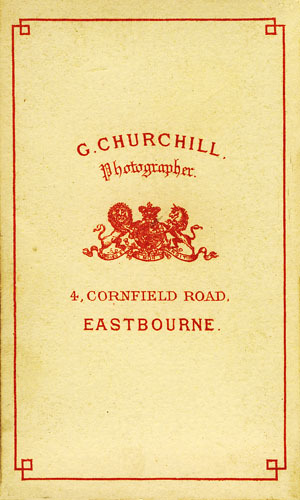 [ABOVE] The reverse of a carte-de-visite portrait showing the trade plate of George Churchill, Photographer, 4 Cornfield Road, Eastbourne (c1877). 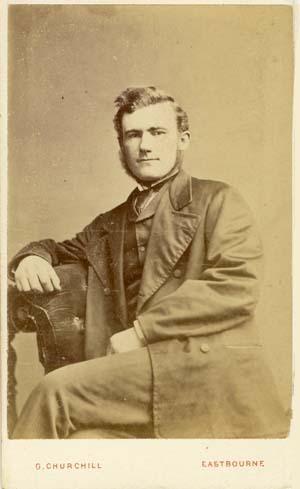 [ABOVE] A carte-de-visite portrait of a seated man, photographed by George Churchill of 4 Cornfield Road, Eastbourne (c1877). 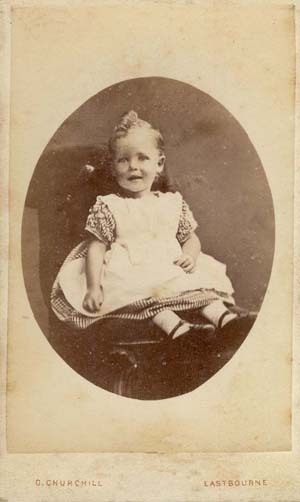 [ABOVE] A carte-de-visite portrait of a young child, photographed by George Churchill of 4 Cornfield Road, Eastbourne (c1877). 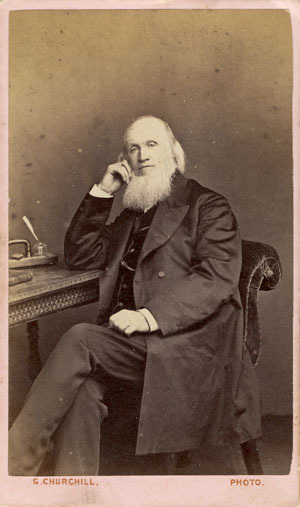 ABOVE] A carte-de-visite portrait of a seated man, photographed by George Churchill of 4 Cornfield Road, Eastbourne (c1877). 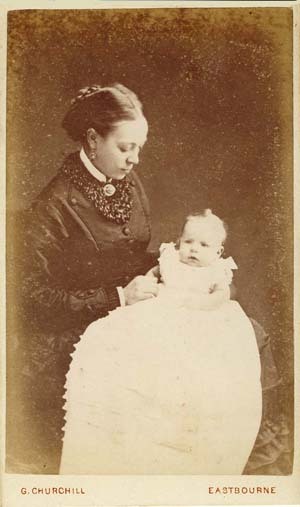 [ABOVE] A carte-de-visite portrait of a young woman with a baby, photographed by George Churchill of 4 Cornfield Road, Eastbourne (c1878). 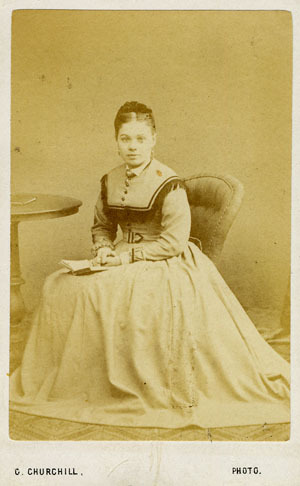 [ABOVE] A carte-de-visite portrait of a seated woman, photographed by George Churchill of 4 Cornfield Road, Eastbourne (c1877). Card mount printed by Oborne of London & Paris. 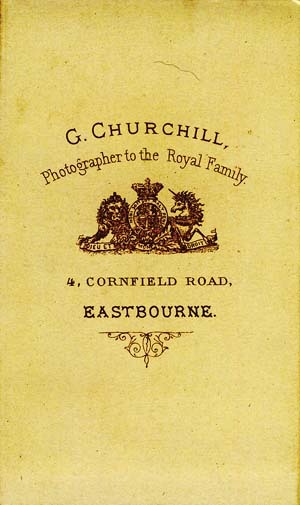 [ABOVE] The reverse of a carte-de-visite portrait showing the trade plate of George Churchill, Photographer to the Royal Family, 4 Cornfield Road, Eastbourne (c1879). 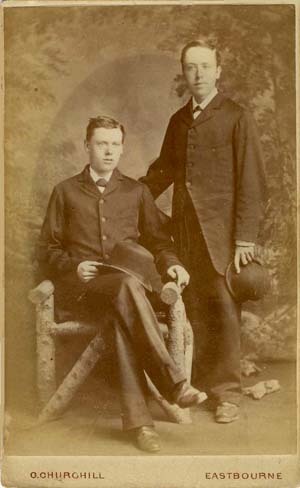 [ABOVE] A carte-de-visite portrait of two young men, photographed by George Churchill of 4 Cornfield Road, Eastbourne (1879). Inscribed on the reverse "Uncle Walter & Uncle Alfred ........Aug 1879". 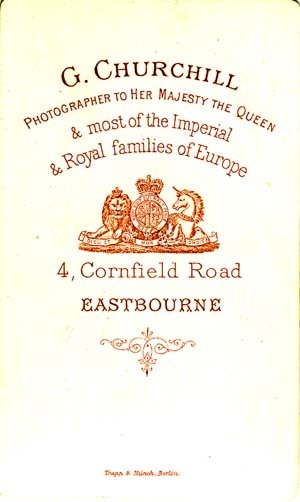 [ABOVE] The reverse of a carte-de-visite portrait showing the trade plate of George Churchill, "Photographer to Her Majesty the Queen & most of the Imperial & Royal families of Europe", 4 Cornfield Road, Eastbourne. Printed by "Marion Imp. Paris". 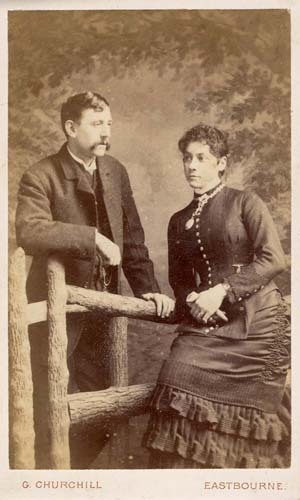 (c1879) [ABOVE] A carte-de-visite portrait of a married couple, photographed by George Churchill of 4 Cornfield Road, Eastbourne (c1882). Card mount printed by Trapp & Munch of Berlin. 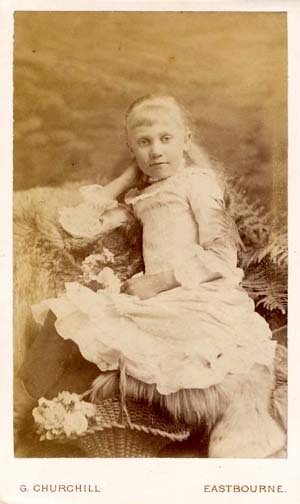 [ABOVE] A carte-de-visite portrait of a blonde-haired girl, photographed by George Churchill of 4 Cornfield Road, Eastbourne (c1884). Card mount printed by Trapp & Munch of Berlin. 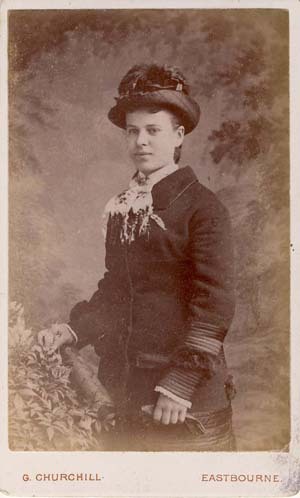 [ABOVE] A carte-de-visite portrait of a young woman wearing a fancy hat, photographed by George Churchill of 4 Cornfield Road, Eastbourne (c1885).Card mount printed by Trapp & Munch of Berlin. 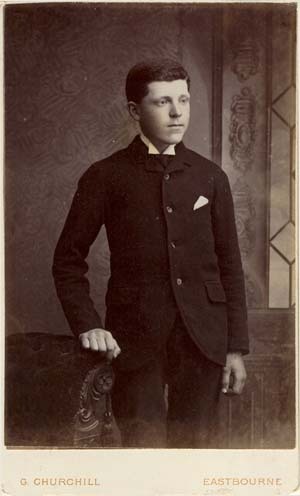 [ABOVE] A carte-de-visite portrait of a smart lad standing by a chair, photographed by George Churchill of 4 Cornfield Road, Eastbourne (c1888). Card mount printed by Trapp & Munch of Berlin. 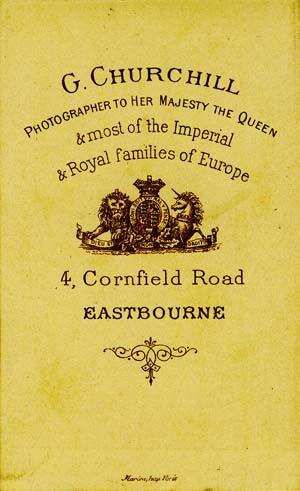 [ABOVE] The reverse of a carte-de-visite portrait showing the trade plate of George Churchill, "Photographer to Her Majesty the Queen & most of the Imperial & Royal families of Europe", 4 Cornfield Road, Eastbourne . Printed by "Trapp & Munch, Berlin". 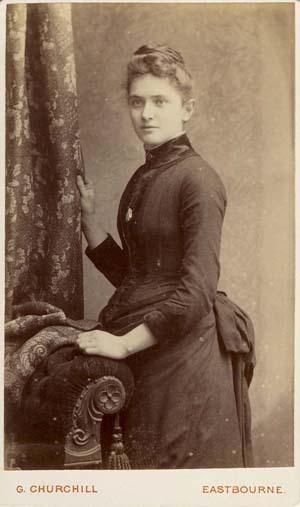 (c1888) [ABOVE] A carte-de-visite portrait of a woman standing by a chair and holding on to a curtain, photographed by George Churchill of 4 Cornfield Road, Eastbourne (c1888). Card mount printed by Trapp & Munch of Berlin. 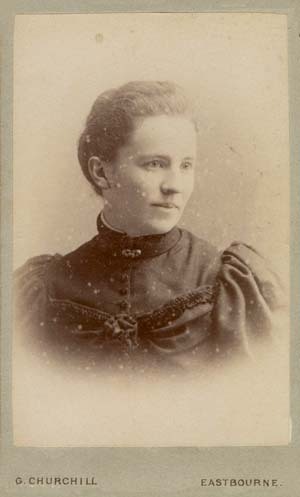 [ABOVE] A vignette portrait of a young woman, photographed by George Churchill of 4 Cornfield Road, Eastbourne (1890). Card mount printed by Trapp & Munch of Berlin. [ABOVE] A vignette portrait of an unknown woman, photographed by George Churchill of 4 Cornfield Road, Eastbourne (c1894). 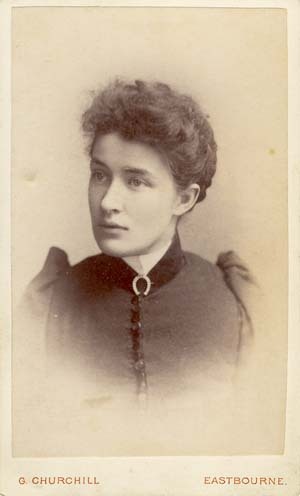 ABOVE] A vignette portrait of an unknown woman, photographed by George Churchill of 4 Cornfield Road, Eastbourne (c1896). 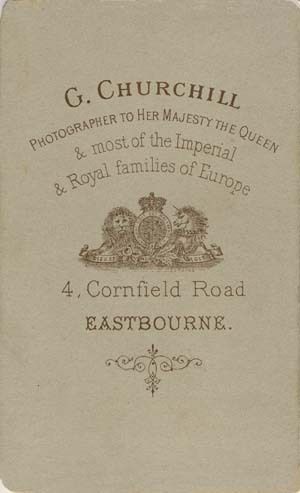 [ABOVE] The reverse of a carte-de-visite portrait showing the trade plate of George Churchill, "Photographer to Her Majesty the Queen & most of the Imperial & Royal families of Europe", 4 Cornfield Road, Eastbourne. Grey card with no printer's mark . 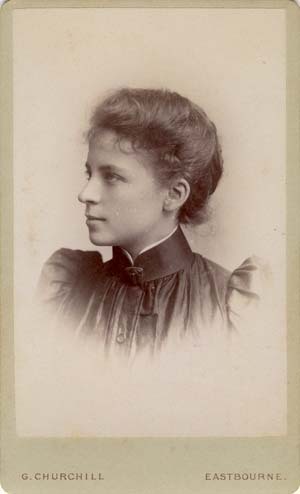 (c1891) [ABOVE] A vignette portrait of a young woman, photographed by George Churchill of 4 Cornfield Road, Eastbourne (1891). 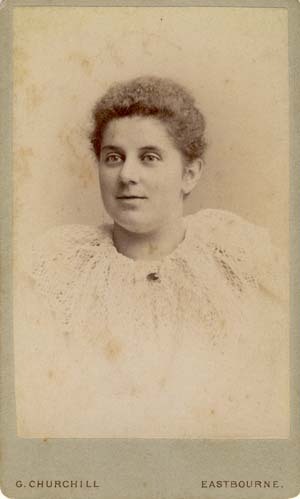 Inscribed in ink on the reverse "July 1891 - Wreda (?) Woodard".